Following the state’s highest ridgelines from the northern border with Canada to the Massachusetts state line in the south, Vermont’s Long Trail is America’s oldest long distance hiking trail. But day hikers can enjoy segments of the trail, and use the miles of well-maintained side trails to reach the more than 40 summits the Long Trail connects. Because the Long Trail – and the Green Mountains themselves – run north-to-south through the center of the state, they are never far from Vermont’s many tourist attractions, making the state a good vacation choice for families with both hikers and non-hikers. Not all of the trails climb mountains. Vermont’s state and local parks are filled with gentle walking trails that explore the state’s natural sights – waterfalls, bogs, and geological formations left by the glaciers – or simply provide a chance to enjoy its beautiful meadows and woodlands. Vermont’s abundant green space and wilderness means that it is also a prime place for observing wildlife and plants. Birders will find hawks circling mountain peaks and rare boreal birds in its forests. In the spring, trails may be lined with woodland flowers, and in the fall, the whole state becomes a riot of reds, oranges, and yellows as foliage changes color. 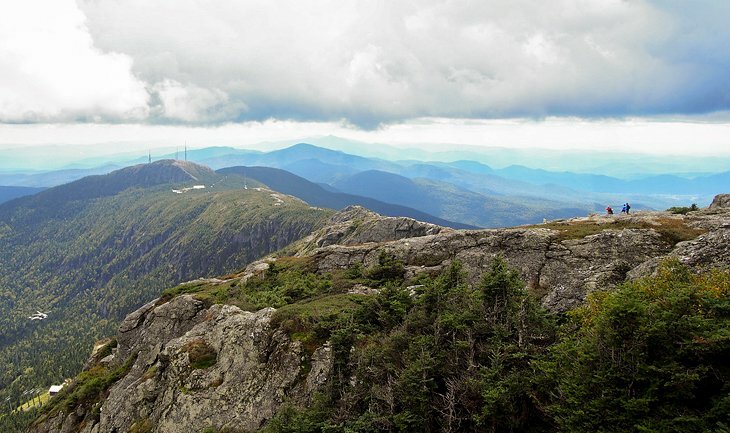 Vermont’s highest mountain is also one of its most interesting and rewarding, not only for the sweeping views, but for the more than two miles of ridge-top hiking above tree line. This is one of only two places in Vermont where rare arctic-alpine tundraexists. There is a much smaller area on Camel’s Hump, but Mt. Mansfield supports 200 acres of rare tundra plants. Because of its profile viewed from the east, locations along Mt. Mansfield’s long ridgeline are described as the Adam’s Apple, Chin – the highest point at 4,393 feet, Nose, and Forehead.